Via RT America: A security company accused of operating without a license in North Dakota has offered a settlement to pay fines – as long as it does not have to admit to any wrongdoing. The private company, TigerSwan, is seeking the settlement for accusations it violated the rights of protestors during demonstrations at the Dakota Access Pipeline. For legal analysis, the host of America’s Lawyer on RT America, Mike Papantonio, joins RT America’s Ed Schultz. Ed Schultz:	The private security company, TigerSwan, is seeking a settlement in North Dakota for violating the rights of protesters, remember this story, at the Dakota Access Pipeline. There were months of protesters by thousands. The North Dakota Private Investigative Security Board has invited the company to offer a settlement before discussing the issue with attorneys. The board accuses the company of operating without a license. TigerSwan denies the allegations and says its investigative work took place outside of the state, and its headquarters are in North Carolina. For more on this, we’re joined tonight by the host of America’s Lawyer, Mike Papantonio. Mike, good to have you with us tonight. What do you make of this story? It seems like there’s always a back story to fake protests as to who’s trying to influence crowds, and who, of course, is really not getting the spotlight, but very much in the thick of things. Legally, take this apart for us tonight. 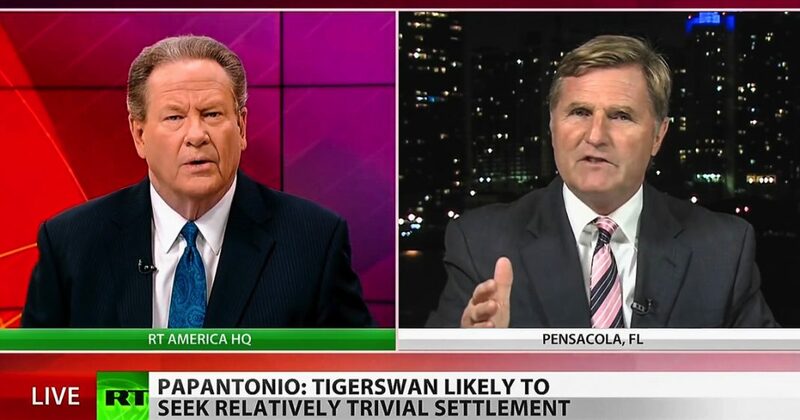 Mike Papantonio:	Well, TigerSwan, first of all, their settlement offer here is very common. They want to pay for some fines without having to admit that they did anything wrong. Truth of the matter is, if you have the Department of Justice take a closer look at this, you’d see they did a lot wrong. The reason they’re doing that is because they’re worried about the fact that all of this information that they gathered becomes useless in subsequent lawsuits that are going to flow from this. Swan isn’t a company that need to build consumer trust. That’s not why they’re worried about disclosure. They’re a private investigation mercenary firm that does their work through government contracts, so they don’t have to worry about losing confidence in the consumers. What the company’s likely trying to do here is just protect information that they illegally gathered, illegally gathered, because lawsuits are coming at them different ways. Mike Papantonio:	This company that hired them, they’re on the hook too here. It’s not just TigerSwan. The company that hired this Blackwater type organization, they’re on the hook for a lot of things that TigerSwan engaged in. Ed Schultz:	Well, what about the protesters? What legal ramification or options do they have, because some of them were injured. I mean, the videotape was pretty ominous. The actions against the protesters, they were threatened, they were shoved, they were beaten. I mean, doesn’t this open up a door of liability? Mike Papantonio:	That’s the point. That is exactly the point. This is the equivalent of somebody who has no certification, no right, no special standing, to show up at this protest and engage in battery, assault, in a whole variety of issues that can make them criminally responsible, if we had a government that had any guts to do something about this. But the real issue that TigerSwan better worry about, and the real issue that the company that hired them, that they need to worry about, is if this is taken away from them. If they have to say, “Look, we didn’t have the standing to do this. We didn’t have the kind of license we needed to do this,” all of a sudden all of these lawsuits become very significant because of the surveillance footage that they’ve taken engaging in all types of assaults on these protesters. Mike Papantonio:	This could turn into a very big case, and truth is, the interesting thing about this, take a look at the media’s coverage on this. It’s almost non-existent. Energy transfer partners have gotten a free ride on this, even though it’s very clear that they’ve gone out and they’ve hired this Blackwater type of government mercenary group to engage in conduct where they had no license to do it there in front of these protesters. Ed Schultz:	Host of America’s Lawyer here on RT America, Mike Papantonio. Mike, thanks for your time tonight. Appreciate it so much.